How does signal foo drive/load signal moo? 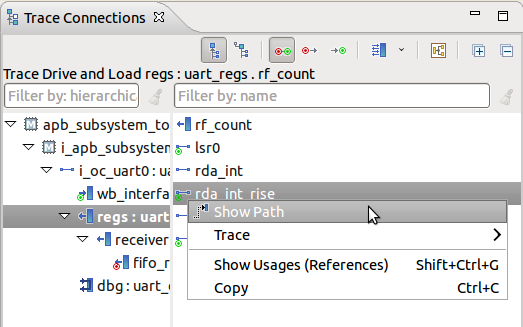 The Show Path option in the context menu allows you to see the trace path from any signal of a connected instance to the original traced signal. A list is displayed containing the step by step path starting with the connected signal and ending with the traced signal. The list contains the signal declarations, instance port connections and assignment statements through which the traced signal propagates. The Writers and Readers of the connected signal are shown next to it. At any time you can see what kind of path the signal is on (drive path or load path). You can change the order the list is displayed, so that it suits your take on the trace kind (from source to destination or reverse) using the button. Also, you can quickly navigate to the next/previous entry in trace path using the and arrows. For a port connection, go to where it is instantiated in the trace path. For a signal, go to where it is declared. For an assignment or combinational block, go to where it is used. For a writer or reader, go to the write or read statement. 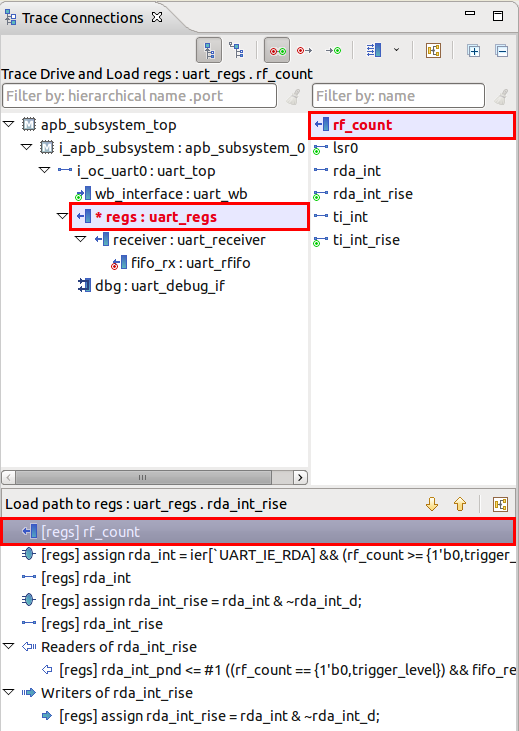 Selecting an element in the list will color red both the corresponding connected instance in the Trace Connections View hierarchy and the current signal in the signals panel. The connected instances on the trace path are marked in the tree with an asterisk before their names.